AmadorArts’ TGIF free concert July 20 will feature the "Old Soles”, an acoustic Americana duo. The concert begins at 6:00 pm in the City Park of Plymouth on Main Street. Bring your own chairs or blankets and picnics to the park. 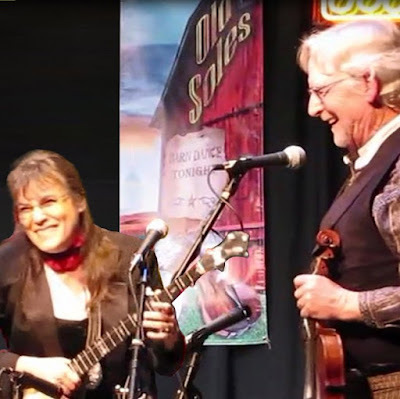 Old Soles are Masha Goodman Crawford and Geff Crawford who play fiddle, banjo, guitar, ukulele, voices and their feet. They blend “a twist of wry-whiskey humor into moonshine-flavored Americana.” The repertoire has its roots in the Appalachian mountains and Irish pubs, rambling from old country blues to front-porch fiddle tunes. That means their style is a little folky and very funny. Masha Crawford has been playing clawhammer banjo and tin-whistle since the 1970s, and dancing and singing since she was a little girl. She has taught and performed in concert halls and folk festivals across Europe and the U.S. Geff Crawford’s fiddling has won him many blue-ribbons, and his humorous songs have won him many fans. Together their music "has an intricately, intertwined sound where the accents accent each other", and their harmony vocals blend on songs from the sublime ("Give Yourself To Love") to the downright silly ("From the Indies to the Andies in his Undies"). The Plymouth City Park is at 9406 Main St., in the middle of downtown Plymouth, where the gazebo is and the weekly farmers’ market. From the Highway 49 roundabout, go west onto Main St. If you go east, you’ll be on your way to the Shenandoah Valley. Don’t miss this free toe-tappin’ musical party for everyone! Visit www.amadorarts.org for more info about TGIF concerts.